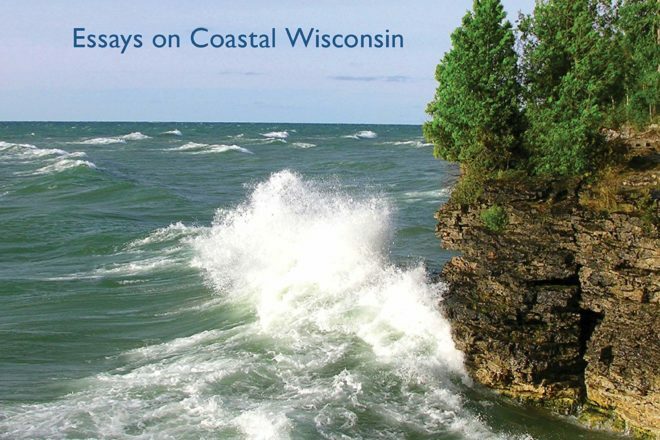 The Wisconsin Historical Society Press helped celebrate last year’s 40th anniversary of the Wisconsin Coastal Management Program with the publication of a book of essays celebrating the state’s coastlines. Called Great Lakes Chronicle: Essays on Coastal Wisconsin, it includes essays written by a wide variety of contributors – including quite a few Door County residents – between the years 2002 and 2018. The essays are culled from the annual WCMP publication Wisconsin Great Lakes Chronicle. Door County is well represented in the volume, beginning with the cover photo of turbulent Cave Point by Jon Jarosh of the Door County Visitor Bureau. The foreword is by former Governor Scott Walker, and each section – divided by the years the pieces were written – is introduced by whoever was governor at the time, so 2002 begins with Scott McCallum (remember him, our 43rd governor, 2001-2003?). The first Door County reference comes in 2002 from Cate Harrington, who then, as now, is director of communications and outreach at The Nature Conservancy-Wisconsin Chapter, in a piece titled “Protecting Coastal Wetlands on the Door Peninsula.” She writes about how the conservancy first got involved on the peninsula with a loan made in 1962 to the Ridges Sanctuary to preserve some coastal wetland. From there, the connection grew to include other partners such as the Door County Land Trust, Door County Soil and Water, the U.S. Fish & Wildlife Service and the Wisconsin Department of Natural Resources. The next Door County essay came in 2005 from Vinni Chomeau, who at the time was a conservationist in the Door County Soil and Water Conservation Dept. Today she serves as project director for Gibraltar Schools’ Friends of Gibraltar and last year was elected as one of the 21 members on the Door County Board of Supervisors. Her essay is titled “Protecting Beach Health in Door County,” which tells the story of how, with a WCMP grant and donations from organizations and local governments, water sampling was used to identify non-point pollution sources. Sturgeon Bay gets a mention in WCMP Director Michael Friis’ essay on shipbuilding, with a couple paragraphs on Bay Shipbuilding (pre-Fincantieri) and Palmer Johnson. Sturgeon Bay shipbuilding gets another mention in the 2011 chapter from Jason Serck, planning, economic development and port director at Superior. From 2014 we have “Egg Harbor Beach and Marina Improvements” by former Egg Harbor Administrator and current Sturgeon Bay Administrator Josh VanLieshout, who writes about the “universally good investments” the village and its partners made in the Egg Harbor Beach and Marina initiative. In 2015 we have a piece titled “New Hope for Islands at Death’s Door” by Tim Sweet, a frequent photographic contributor to the Pulse and president of the Friends of Plum and Pilot Islands. And in the final section, 2018, we have an essay co-written by Mike Grimm, a conservation ecologist with The Nature Conservancy, and Greg Coulthurst, a conservationist with the Door County Soil and Water Conservation Dept., titled “Dunes Lake – A Forgotten Paradise,” which tells the story of the test dredging project that took place at “this obscure little paradise,” with plans to continue dredging muck out of the remaining 18 acres of the lake. Taken as a whole, Great Lakes Chronicle tells an important story of conservation partnerships not just on this peninsula, but throughout the coastal communities of Wisconsin.